What is a FULL PAGE AD in the online Christian Business Directory? Your ad consists of text and/or graphics, including your logo, to approximate an A5 or A4 page. There are no additional charges for us to prepare a standard layout based on text and graphics supplied by yourself. You may change the content on your page once per month free of charge. Other changes - P.O.A. Display Ad in the Directory of Christians in Business, linked to your Full Page. Listing in the Directory of Christians in Business, linked to your Full Page. 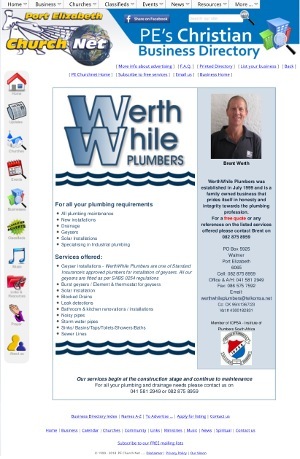 Full Page Email Ad - we send your page once per year to over 5500 email recipients (value R900). Your Display Ad is included once every 4 months in our weekly E-Classifieds in our weekly E-Classifieds, sent to over 6200 recipients (value 3 x R240 = R720). Your Display Ad is displayed as a 'banner ad' at the top of our Classifieds page on a random rotational basis - minimum 1500 views per year. Bold listing in our condensed Email Business Directory emailed every quarter to over 5500 recipients. Bold listing in our printed Business Directory supplement - minimum 10,000 copies distributed per year. - More info at www.pechurchnet.co.za/cbd/printed_directory_info.php. Related: What is a Listing| Display Ad | Jumbo Display Ad ?